Prescription drugs not only pollute water. They also make you drink more of it. William Pentland, writing in Forbes, makes the case that the “blindingly obvious” reason that bottled water sales grew 7% in 2012 and has, in fact, grown steadily since the mid-1970s, is that people are thirstier than they used to be. And the reason, they are thirstier, Pentland argues, is because of the prescription medications they take. “. . . . [we are ignoring] the blindingly obvious reason why bottled water has become a boondoggle: Americans are thirstier than they used to be. Xerostomia is the subjective feeling of having a dry mouth resulting from the dysfunction of the salivary glands. Drug-induced xerostomia is a common side effect of over 1,800 forms of medications, including antidepressants, antihistamines, anticonvulsants and antipsychotics and other medications prescribed for high blood pressure, anxiety, allergies, weight loss, pain and so on and so forth. The more drugs a person takes, the more likely he or she will experience dry mouth. 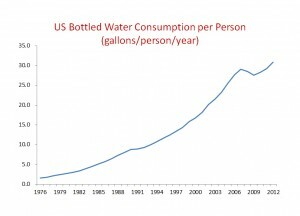 The graph shows linear growth of bottled water sales between 1976 and the late 1980′s and then exponential growth during the 1990′s and 2000′s. Generally speaking, the pace of growth in bottled water accelerated with the introduction of antidepressants. In 1987, the Food and Drug Administration approved Prozac. By 1988, nearly 2.5 million prescriptions for Prozac were dispensed in America. 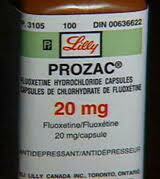 In 2002, Prozac prescriptions had increased to more than 33 million. By 2008, antidepressants were the third-most-common prescription drug taken in America. The American Academy of Oral Medicine prescribes the following treatment for people suffering from dry mouth: “Frequent sips of small amounts of fluids, especially water, can be quite helpful in diminishing the effects of oral dryness. Many patients keep a bottle of water handy to moisturize their tissues.